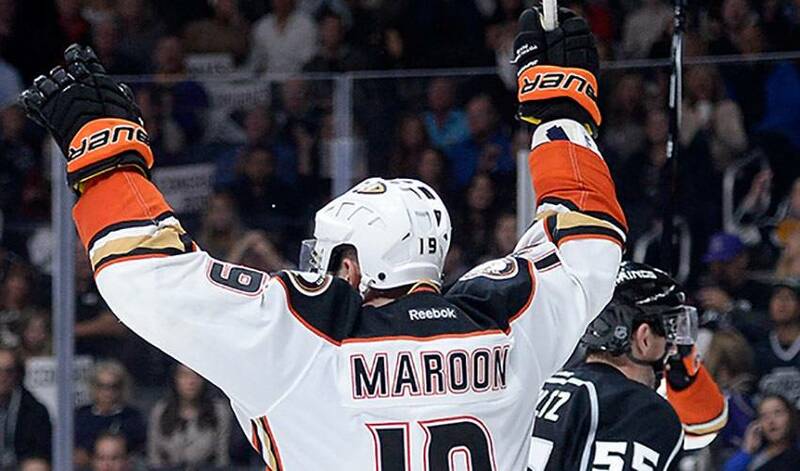 As a hockey player, Patrick Maroon is certainly deserving of the ice time he’s seeing in the Stanley Cup Playoffs. As a father, the Anaheim forward is grateful for the daily opportunity to talk hockey and just about everything else with his biggest fan. Whether it was 16:42, 17:48, 18:01 or 15:21 – how many minutes he was on the ice from Game 1 to Game 4 of Anaheim’s first-round sweep of the Winnipeg Jets – Maroon made his presence known. The 27-year-old hardly looked out of place skating alongside the superstar pairing of Corey Perry and Ryan Getzlaf. For his part, Maroon had one goal, three points, and a plus-two rating in the Ducks’ Western Conference quarterfinal triumph. That’s one of first things the left-winger shared with his six-year-old son, Anthony, when the two connected for their daily FaceTime conversation. One thing Anthony, who was in the stands to see his dad’s first NHL goal (February 16, 2013, in Nashville), won’t hear from his father is any trace of conceit. But, as Maroon acknowledged, with extra effort, there is more chance mistakes will be made. The next challenge that awaits the Ducks in their Stanley Cup quest comes in the form of the Calgary Flames, a spirited group that ousted Vancouver in six games in the first round. Maroon hopes he’ll have plenty of good news to share with his son in the coming days. A win-win no matter what the scoresheet might say.